The file TMagic B18 v.2.3.3.1 is a modification for RimWorld, a(n) strategy game. Download for free. TMagic is a mod for RimWorld, created by TorannD. RimWorld Mod that adds magic abilities. Hurl massive fireballs, summon lightning storms, blast enemies with frost rays and even manipulate matter to give that special pawn a few tricks to save your colony from the ever growing dangers of RimWorld! Adds 4 unique magical trees: Fire, Ice, Lightning, and the Arcane. Each tree specializes in a specific area, with each line providing a unique group enhancement. All abilities require mana that will slowly regenerate, or can be rapidly replenished with mana potions. Mana potions are very addictive and require talented crafters and a large variety of ingredients. Specially marked pawns (possess the "Magically gifted" trait) may attune themselves to an elemental tree by reading arcane scripts. These scripts are costly, but can be found being sold by the occasional exotic goods trader. Future releases will provide additional means to acquire these books, though none are intended to be easy! Fire tree grants deadly area affect attacks, but can be unpredictable and difficult to hit with. It also has a tendency to start large fires! Fireball - massive, long range, slow moving fireball that devastates a large area. Firebolt - launches multiple, smaller bolts of fire that create small explosions. Fireclaw - generates a wave of fire that expands as it extends. Ray of Hope - generates a small mood improvement and increased work productivity. Ice, though not directly powerful, is useful by decreasing the enemies ability to move and fight with debilitating side effects, and is the perfect element when backed by more conventional fighters. Snowball - launch a ball of compacted snow and ice that shatters, causing damage and movement debuffs. Icebolt - single target shard of ice that shatters on impact, causing massive bleeding and frostbite, decreasing the targets ability to fight. Frost Ray - beam of super cooled particles that damages and freezes targets, rendering them nearly immobile. Soothe - buff that calms and concentrates pawns. Rainmaker - as simple as it sounds, this spell can cause atmospheric conditions to change, making it rain. Lightning generates deadly weather conditions, whether is a lightning storm that strikes friends and foes alike in a target area, or a deadly cloud of electricity that stuns and damages all within. Even more random than fire, though not quite as dangerous to nature. 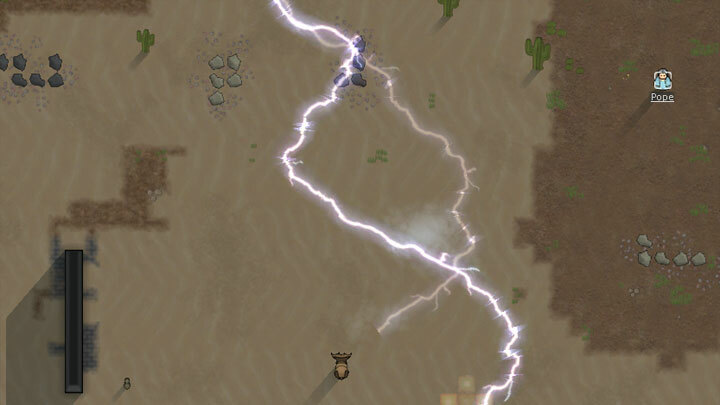 Lightning storm - summons a lightning storm (near) the target location where lightning bolts randomly and rapidly strike any unlucky enough to be in the storm. Lightning cloud - creates a large cloud that has a chance to stun and slightly damage any inside the cloud. Lightning bolt - single target bolt of lighting that strikes the target. AMP - Buff that energizes colonists, allowing them to work faster, longer, and harder than before. Rapidly causes fatigue. Arcane is the master of movement. Abilities within this tree will provide an edge on positioning and controlling the battlefield just as much as providing indispensable control of mundane tasks. Blink - rapidly moves the caster pawn to a distant location. Summon - can be used to summon both pawns (friend, foe, and animals alike) to the caster, and can also summon objects from distant locations at will. Shadow - a shadowy assistant that augments every day tasks for colonists, however, it creates a creepy sensation, like you're always being watched! HugsLib and JecsTools are required to run this mod.